The Voice briefly introduced the show's new Live Cross Battles round during Tuesday night's episode without going into much detail. NBC has announced this game-changing live round will feature artists from opposing teams competing head-to-head live for America's vote. 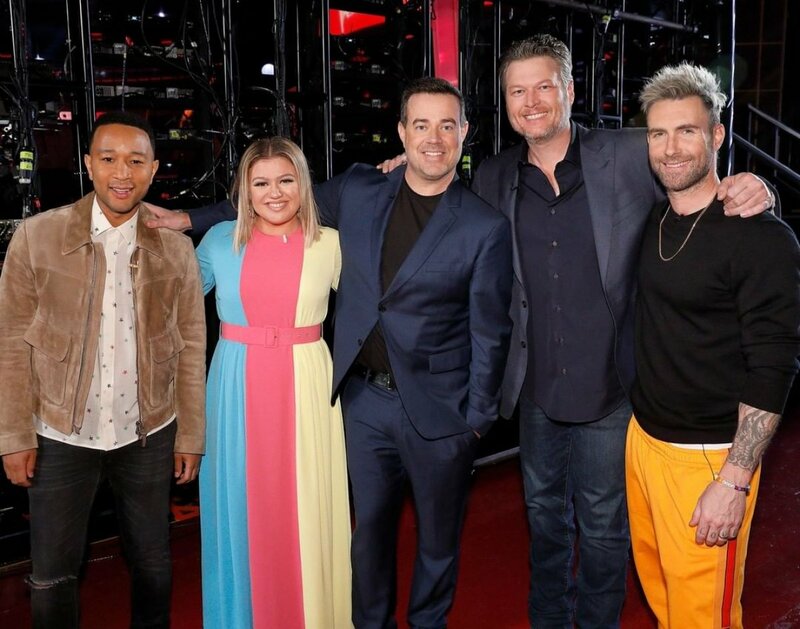 For the first time in The Voice history, coaches Kelly Clarkson, Blake Shelton, Adam Levine, and John Legend will each select an artist from their team in real time to compete live against an artist from a different team in a series of faceoffs. The Live Cross Battles round will begin with 32 artists remaining in the competition. Over the course of two weeks, eight pairs of 16 artists will perform each Monday night. "The Voice will unveil a brand new Cross Battles set design, in which the artists will be seated by team on dramatically lit benches around each side of the stage," according to NBC. "In every Cross Battle, two coaches will go head-to-head in a 'live school yard pick,' each selecting one artist from their team to go up against another team's artist." The two selected artists will each perform an individual song, and their fate will be in America's hands to decide the winner. On the Tuesday night results shows, The Voice host Carson Daly will reveal the winner of each Cross Battle, and 16 artists will advance to the next round through America's vote. In this round, however, each coach will be allowed one "Save" and one "Steal" to use in the heat of the moment. An artist can be stolen from an opposing coach's team, while the "Save" allows a coach to keep a certain, beloved team member on his or her own team going forward into the live shows. The coaches will apparently only have 10 seconds to decide whether they want to push their button to save or steal an artist. "In another unprecedented first, coaches could enter the Top 24 live show with uneven teams as America decides the winner of each Cross Battle," according to the network. The Live Cross Battles will kick off on Monday, April 15 with a two-hour episode at 8PM ET/PT on NBC. The Live Cross Battles will continue to air on Tuesday, April 16 from 8-9PM ET/PT; Monday, April 22 from 8-10PM ET/PT; and Tuesday, April 23 from 8-9PM ET/PT. The stakes will be higher than ever as the power shifts to America early on and home viewers get to determine the sixteenth season's Top 24 artists.